Mom, the Intern: Goodwill hunting. My friend Brittany and I braved our favorite thrift store, Goodwill, yesterday morning. We only go on Thursdays because it's DOLLAR DAY!!! Which means every item with a tag of a particular color (yesterday's color was green) is $1. You know, 100 cents. I'm not even kidding. Doesn't matter what it is. A humongo vintage couch? A dollar. That barely-worn Armani boyfriend cardigan that Brittany found (jealous)? A DOLLAR. Dollar Days are the bomb, though I sometimes think it's rigged because none of the things I really want ever have the color tag of the day. Then, I leave feeling depressed because I had to rifle through a bunch of urine-scented clothes for nothing. Yesterday was particularly awesome because Buckwheat, despite going pee three times that morning, decided to urinate all over the Ladies' Skirts aisle about five minutes into the trip. I was like, are you KIDDING ME right now?! But then I realized, hey, it already smells like pee in here, so no one will even know the difference! I mopped up the mess with a huge wad of baby wipes I happened to have on hand, changed him in the disgusting bathroom (which had NO SOAP or paper towels, by the way. Thank heavens I had hand sanitizer in my Mary Poppins bag) and we were on our merry way. NOTHING gets in the way of Dollar Day. Not even pee-pee pants. Not even empty soap dispensers! It's serious business. Sorry for the atrocious angle. I try. But LOOK! 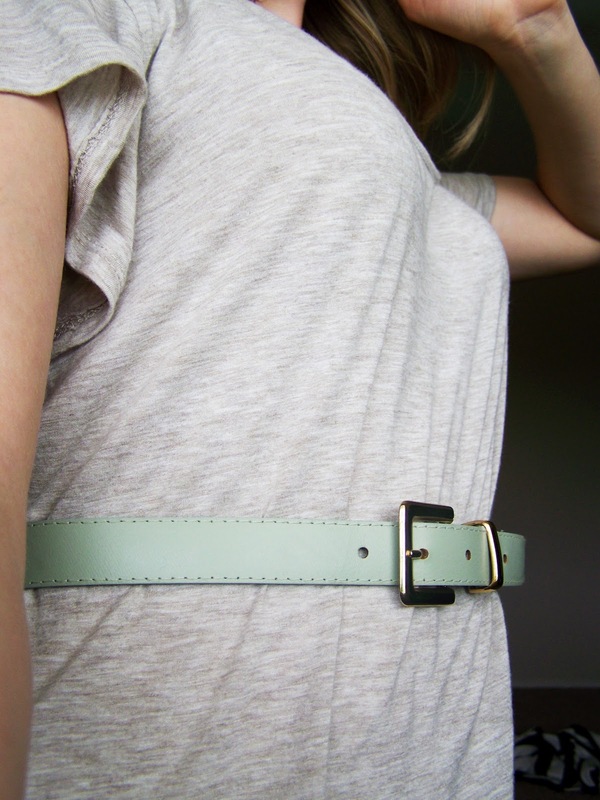 It's a mint-green belt with a gold buckle. Seriously legit. The best part is, I got another one with it (a camel-brown color ... not as exciting) and even though both were priced at 99 cents, the cashier only charged me $1.48 for both. I paid in COINS because they were so cheap (and besides, my purse was starting to get heavy). Two freaking sah-weet belts for a buck-fifty. Dollar Day is where it's at, y'all. Even if your kid pees on the floor in the midst of it all. Even then. I went to Goodwill yesterday and found the most amazing 60s rocking chair that smelled like cat urine. It broke my heart. If I could believe that that smell could be removed, I would go back and get it, but in my mind cat urine is right up there with skunk spray. The point of this info share is to emphasize that Goodwill was all about the urine yesterday. "Urine-scented clothes" -- LOL, Jenna you crack me up!